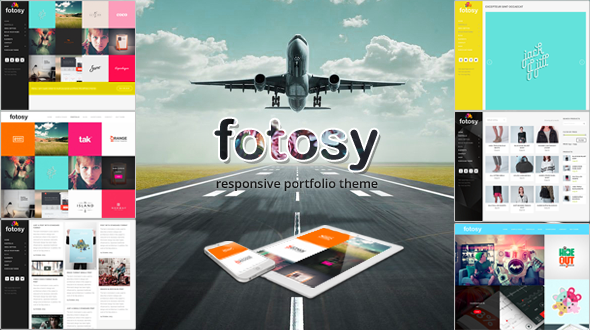 Fotosy is Unlimited Layouts, Unlimited Colors, Ultra Responsive, very Clean & Unique Multi Purpose WordPress Theme that is suitable for any kind of business, group or personal. You are a business owner ? This theme is for you. A designer or photographer ? This theme is surely for you. A blogger ? Again, this is also for you, etc. You will only need this theme for all of your different websites with different styles, one theme for all purposes, this is final theme you will buy !
. Unlimited Layouts, you can create your own unique layouts.
. Unlimited Colors, choose any color scheme you love.
. Ultra Responsive, your website will display very well in any devices (Desktop, Laptop, iPad, iPhone and others).
. WooCommerce plugin ready, you can open an online shop easily with this popular shop plugin.
. Left Side Menu or Top Menu Modes are easy to select in Theme Options area.
. Boxed or Wide Layout can be chosen easily.
. Compatible with all Major Browsers (Chrome, Firefox, IE, Safari, Opera).
. 100% Fluid, perfectly fits any device.
. Multi Purpose, the theme is suitable for any kind of business, group or personal.
. Advanced & Modern Slider (Save $15.00), you can place the slider anywhere you like in page or post.
. Drag & Drop Page Builder integrated (Save $30.00), you can now easily build websites even if you are very new and do not know what shortcode is.
. Demo Content included, you can use it to build the site that looks like our demo so fast.
. Font Awesome integrated, vector icons scalable can be easily inserted into your pages or posts.
. Unlimited Header Styles for your pages or posts, help you make your own unique designs.
. Mega Menus with many columns for you to choose if your items list is too long for normal standard menu of WordPress.
. Very Clean, Modern and Unique Design.
. Validated HTML5 & CSS3.
. Very Strong & Mixable Shortcodes, for you to create your own designs with your Creativeness.
. Over 600 Google Fonts for you to choose.
. Advanced Theme Setting Panel, so you can set up the theme the way you like, very easily.
. Unlimited Sidebars, create as many sidebars as you wish.
. Build your own unlimited Home, Services, About Us, Team pages or others using wonderful Drag & Drop Page Builder.
. Multiple Header Options for pages, posts and projects.
. Many Layouts for Blog Page (Posts Listing Page): Full Width, 2-Column, with or without Sidebar, or very cool Masonry Style.
. Sidebar or Full Width Layout for Single Post.
. Many Modern & Super Clean Layouts for Portfolio Page (Projects Listing Page): 2-Column, 3-Column, 4-Column, 5-Column or Masonry Style.
. Many Layouts for Single Project Page.
. 9 Custom Page Templates included.
. 6 Custom Post Types for you to choose.
. Many Custom Widgets ready.
. Tested for Compatibility with Most Popular Plugins.
. Free download the new Updates. CHECK OUR OTHER WORKS YOU MAY LOVE !